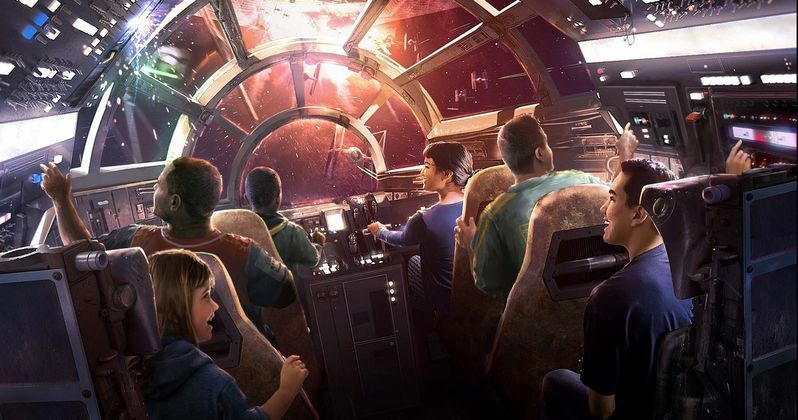 We've just been given our first look inside the Millennium Falcon ride that will take over Disneyland and Disney World in 2019. The theme park attraction is set to be one of the pillars of Star Wars: Galaxy's Edge, the massive Star Wars themed land that is being added to Disney's theme parks in the near future. Now, thanks to Disney Parks, the first look at the Star Wars attraction has been revealed. It may not be much, but it's enough to get fans excited. The image shows the inside of the Millennium Falcon. Specifically, we're seeing the corridor leading to the cockpit. A location very familiar to Star Wars fans. The ride is going to be a flight simulator of sorts, allowing visitors to take control of the fastest ship in the galaxy for themselves. So seeing the corridor leading to the cockpit of the ship that did the Kessel Run in 12 parsecs is pretty cool. Though, we'll probably never see it this empty, as the attraction will literally be flooded with people once it's actually open. "'We're home.' #starwars #galaxysedge, Learn more this Saturday at Star Wars: Galactic Nights at Disney's Hollywood Studios." Since the Star Wars: Galaxy's Edge attraction won't open until 2019, we haven't seen too much from the park. But it sounds like Disney is going to open up the playbook a bit this Saturday. Hopefully, that means we'll get a better idea of what to expect from Star Wars land and, specifically, what this Millennium Falcon ride is going to be like. Bob Chapek, Chairman of Walt Disney Parks & Resorts, had this to say about Star Wars: Galaxy's Edge over the summer. "It's unlike anything that exists today. From the second you arrive, you will become a part of a Star Wars story! You'll immediately become a citizen of the galaxy and experience all that entails, including dressing up in the proper attire. Once you leave Earth, you will discover a starship alive with characters, stories, and adventures that unfold all around you. It is 100% immersive, and the story will touch every single minute of your day, and it will culminate in a unique journey for every person who visits." In addition to the Millennium Falcon ride, Star Wars: Galaxy's Edge will also include tons of Star Wars themed food, shops and attractions, as well as "an epic Star Wars adventure that puts guests in the middle of a climactic battle between the First Order and the Resistance." There's still no specific opening date for the attraction, but we do know that Disney plans to open it to the public in 2019. Be sure to check out the first look at the Millennium Falcon ride, courtesy of the Disney Parks Twitter account, for yourself below.